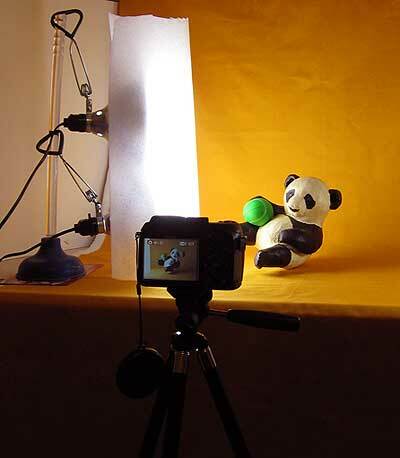 This post shows the new tabletop photo studio I set up for taking pictures of my paper mache animal sculptures. The total cost includes a new Fujifilm FinePix S1500 camera, new daylight florescent bulbs and colored fabrics to be used as “seamless” backdrops. My little makeshift photo studio seems to work quite well for close-up photos of my sculptures. Since I spent the smallest amount of money I possibly could and still ended up with a very workable setup, I thought you, as a fellow artist, might be interested. The total cost of my new “studio” was $247.55. Some of the parts were rummaged from my garage, so the costs of those items are not included in that total. According to Steve Meltzer’s book Photographing Arts, Crafts & Collectibles , (a great book – highly recommended), I needed a camera with at least 8 megapixels, but my Canon has only 4. Some online research pointed me to the Fujifilm FinePix S1500 , a 10 megapixel camera that has some of the automatic features that I really need. Oddly enough, the Fujifilm camera cost me $160, plus another $19 for the 8 GB memory card, while the Canon is priced at $350 – about what I paid 5 years ago. There are probably good reasons for the price difference, but I’m not an expert on cameras so I have no idea what those reasons are. The features of the new camera that I’m using most are the image stabilization and the 2-second delay. The next thing to buy was lights. My sculptures are too large for those nice little softbox tabletop studios that come with lights. I’ve also read that the lights that come with those setups aren’t really bright enough. I read Mr. Meltzer’s recommendations on lights, and all his suggestions were pricey. The most reasonable lights he mentioned in his book were the Lowel EGO Tabletop Fluorescent Light Unit , which cost about $100 each. I would need two of them, so I won’t be buying them any time soon. However, when I looked them up on Amazon.com I saw that they sell replacement bulbs for these units. The bulbs have a 5500deg. K (daylight) color temperature, which should help me get true-to life colors on my sculptures. I also discovered that another company sells bulbs that appear to have the same specifications, but which cost half as much. They may not be an exact duplicate of the Lowel bulbs, but when you buy four of them, $7.99 ea sounds a lot better than $15.75. The bulbs are only 45 watts, but they put out the same amount of light as a 225 watt incandescent bulb. The bulbs arrived by UPS yesterday. (We don’t have a camera store here in town – that’s why I had to order everything online). The next problem was how to actually use the bulbs, since I didn’t buy the fixture that goes with them. I rummaged through my garage and found three clip-on shop lights and an old toilet plunger. I’m not proud. I clipped the fixtures to the plunger, and set a piece of foam in front of the lights to act as a deflector. The foam is about 1/4 inch thick, and is left over from a small remodeling project I did last year when I replaced my carpet with Ikea laminated flooring. The foam is intended to be used as padding under the flooring planks. 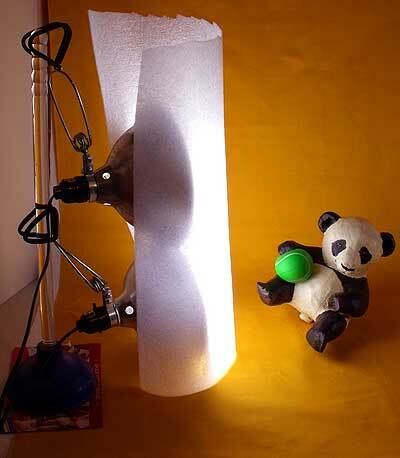 I used another shop light fixture on the other side of the panda, with a make-shift foam reflector in front. Three lights seemed to be enough for the little panda, but I will probablyÂ need all four when I shoot larger sculptures. Note: I would not even consider using this set-up with incandescent lights. That would be a good way to burn down a house. Although the florescent lights don’t get very hot, I still won’t be leaving them on very long. I tend to be overly cautious when working with things that can cause fires, but that doesn’t seem too unreasonable. Next came the backdrop. I’ve been making do with various things as backdrops for photos on this blog, but I decided to splurge and buy some colored cotton material in several colors that I could use behind the sculptures in the new book. I bought 5 different colors, and the total cost was about $22. To get the nice smooth “seamless” look, I first emptied out a closet in my office andÂ hung an old 36″ wide window shade on the back wall. A table was placed in front of the shade. When the shade is pulled down and over the table top, it creates that nice smooth bend where the wall and table meet. I then clipped the top corners of my new colored cloth to the shade’s hardware, and it lays very smoothly over the shade. The hardest part was finding my iron so I could get rid of the fold marks. The backdrop fabric has to be folded away on a shelf and the shade has to be rolled up after each photo session, to prevent little paw prints from appearing on them. I have cats. I’m still learning the new camera and I doubt that I’ll ever become an expert photographer. Start talking f-stops and my brain freezes… However, I’m reasonably happy with my new studio set-up and the new camera, even though I’m still using the automatic settings. The photos on this page were altered slightly in Photoshop. The large panda image in the right sidebar was lightened quite a lot, and I used the “sharpen” filter and corrected the color. Once I know more about the camera and play around with the lights, I shouldn’t need to lighten images in Photoshop – as you can see the panda’s belly detail got lost when I did that. If I used my last lightbulb and focus it on the backdrop, I should get a photo that will be bright enough for the happy subject matter of this blog. Even with the daylight lamps, the color is slightly off – I added a bit of red to correct the background and the panda’s rubber ball. However, I know my own computer monitor’s calibration is off, so I don’t know what the colors will look like in print or on your screen. I’ll do a test print one of these days to see what they really look like on paper. The new camera makes me nervous, just because my old Canon seemed so simple and bomb-proof. A few weeks ago my 30-month old grandson borrowed my camera and took some wonderful photos of me and his mother (and his truck book, and his foot…). I would not feel comfortable giving the new Fujifilm camera to a toddler. The lens is much larger, and has a lens cap that I would immediately lose if it wasn’t tied on. The camera is much bigger, and the instruction book is full of cautions. That said, even when everything is on “auto,” it seems to take sharper images than the Canon. The photo below was taken with the Canon PowerShot, while the photo at the top of the page and the panda in the sidebar were taken with the new Fujifilm. Both this and the photo at the top of the page were taken with the camera held in my hand. The Fujifilm’s Dual IS mode somehow reduces the blur caused by the camera shaking, which always happens when you push the button to take a picture. Even with the low-resolution of an online photo, you can see that the photo at the top of the page is more clear, but at this resolution you have to look very close to see the difference. I used the “sharpen” filter in Photoshop with both photos. You can see in this photo how the clamp lights are set up on the toilet plunger. This would not work if the bottom light didn’t sit on the table. What you can’t see is the golden retriever helpfully lying under the table, and threatening to knock over the tripod. All told, I think my studio is working well. It’s going to be getting a lot of use in the next month or two as I build the new projects for my book. I should spring for a new tripod, since the one I bought at WalMart several months ago is flimsy and my office is usually occupied by myself, two cats and two dogs. We’re all clumsy and I really don’t want that new camera to hit the floor. By the way – did youÂ notice I changed the look of my blog? I wanted a less-cluttered sidebar. Tell me what you think. A home studio can be as sophisticated as the local commercial shooting space or as simple as a sheet taped against a white wall and lit with floodlights from the local hardware store. Whichever route you take, studio photography opens up new opportunities for the photographer in search of more creative possibilities. Impressive and very artistic. Aside from the paper mache as you model which is cheap because it is made of recycled paper, you were able to set-up a studio made of cheap materials and some stuff’s from the garage. This is concept will help newbie photographers or those trying to cut the budget for photography that doesn’t need necessarily to sacrifice the photo qualities. Begin by deciding which room or space you have decided to use as your studio, a medium size guest room or a corner section of a large room are good choices. Next, choose one of the large bed sheets and hang it on a wall as a backdrop. Having several choices of patterned or solid color backdrops at hand will give you more options for mood and atmosphere. Now take your 3 floor lamps and exchange the existing bulbs with the two 40 watt bulbs and the one 60 watt bulb. By having these varying bulb intensities you will be able to control the amount of light you shed onto your subject more easily by employing different combinations of the three. Tilt the floor lamps toward your subject area so the lamp’s light shines onto the area you are going to photograph. This is done best by leaning the lamps against any 2 to 3 feet high stable object such as a chair or ottoman. As a photographer, I’m very impressed at your resourceful thinking! Thank you for posting! I purchased a Finepix S1500 to take photographs of my oil paintings. The camera is great but I had some glare where the lights reflected off the paint. I am going to try your great solution with the plastic and the light bulbs! I used regular house light bulbs and I think this might be where my glare came from. I think everything looks great!!! By the way do you have any idea about when your book will be ready for purchasing by the public? I need to set up a book budget and save some money for this. I love your work and definately want your book. The blog looks good…your studio is great! I was smiling at your reference to cats, dogs, and clumsiness. I can relate! Yeah – I sometimes think we all spend our lives in my tiny office. Dogs do warm the place up, but they make a lousy carpet – so many lumps to trip over!